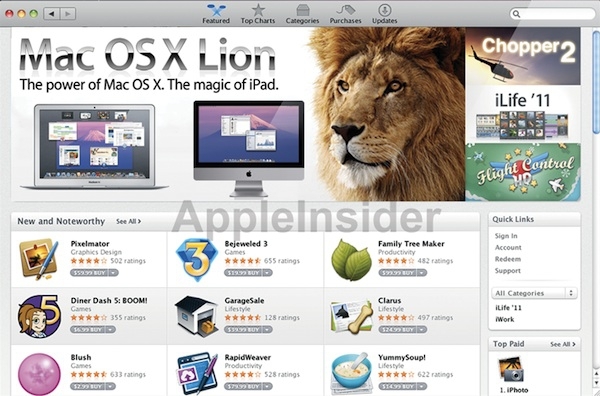 OS X 10.7 Lion to be Released Through Mac App Store? "With the release of Mac OS X 10.7 Lion this summer, Apple will make the switch to a new kind of digital distribution for its operating system upgrades by releasing the software first through its new Mac App Store, AppleInsider has learned." Not really surprising if this comes to pass, and it sure will make it convenient for those of us with the MacBook Airs. And this seems to go along with what appears to be a move towards removing the need for physical media such as DVDs. Even if this were put on a thumb drive it would be better than having it on DVD in my opinion. And this goes along with Apple making the app store a big part of OS X Lion and the removal of boxed software from the retail stores. I think this does put those who depend on physical media ie those with slower Internet speeds at a disadvantage, or at least it makes it more inconvenient for them, but I'm all for less clutter and going the way of the cloud. What are your thoughts about this move, good? Bad?